Pollution and Where it Goes! The plastic sand in this video makes you wonder what it would be like to walk on a plastic beach if this patch got too bad. So please try and reduce the amount of waste you are throwing out. Some plastics are recyclable so look for a recycle sign on items. You can look at my post named “How Recycling Helps the World” for further information on recycling. A tsunami is pretty much a huge, strong wave of water that can wipe out loads of homes. It can destroy peoples lives. A tsunami happens when an earthquake beneath the ocean occurs. And that’s exactly why I’m putting earthquakes in the same post. An earthquake happens when the earth’s many layers of rock aren’t as stable as they usually are. That causes the earth to quake. And that’s obviously where earthquake gets its name. An earthquake, like a tsunami, can destroy lives and homes. An earthquake would shake down your house if it was strong enough. That’s all all for earthquakes and tsunamis. To start off this post I’ll tell you a fun fact. Did you know that a cyclone is the same thing as a typhoon and hurricane? Watch this video to see the affects of a cyclone, typhoon or hurricane. Cyclones cause a huge mass of devastation around the globe, but like most natural disasters, in some places they can’t form. I hoped you enjoyed reading this post. A tornado starts when hot and cold air chase each other around. This forms a shape a bit like a whirl pool. So, tornados are made up of hot and cold air. In some places, people have tornado proof shelters to keep safe, since tornados can destroy hundreds of homes. Tornados can only start on tropical islands. For example, tornados can’t start in Australia because Australia isn’t a tropical island. Another name for tornados is twister. 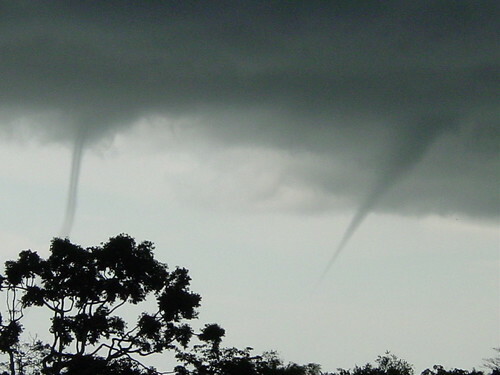 Here are two twisters starting up. On these posts you will learn what starts natural disasters, and what the natural disasters are made of. Enjoy reading these posts, and I hope you learn something new.